After having an extremely hectic few months that included a wedding (my own!) a honeymoon a house move and another trip to the sun. My body and especially my skin are stressed, dried out and a little neglected in general. So i've decided its time to pull myself together in an attempt to fix this. 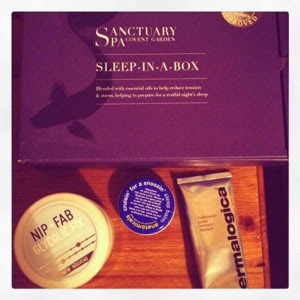 Ive got a few products to mention in this post NIP + FAB GLYCOLIC FIX PADS, DERMALOGICA MULTIVITAMIN POWER RECOVERY MASQUE, SANCTUARY SPA SLEEP RANGE BODY BUTTER and finally ANATOMICALS SLEEP BALM. Up first I am going to tackle my face. So after all of the changes in weather my skin has been dried out and dull and i obviously wanted to change this so im starting by using NIP + FAB GLYCOLIC FIX exfoliating pads. First off I like the packaging its simple and unfussy and i like how strong the plastic is as a lot of this type can be very flimsy. On opening the smell is definately a chemical type one but isnt that overwhelming well once you dont stick your nose in too close like i did oops! I was excited to start using this as it claims to "unveil younger looking skin, resurface & retexture skin helps to tone and reveal brighter and smoother skin" to me this sounds amazing and exactly what im in need of. The pack contains 60 pads and reccomends to use once or twice daily. the first few days i used this in morning and found my skin to be a little shinier than i wanted for daytime so i switched to night use this greatly helped. i really liked using this product I was a little scared at the start as i dont relish the thought of putting anything with the word 'acid' on my face but the pads are so gentle. I definitely noticed a big change in my skin after using I wouldnt go as far as to say younger looking but it was brighter and healthier looking. all in all I will be continuing to use this. Next up Dermalogica multivitamin power recovery masque. This claims to rescue stressed and aging skin, ahem exactly what im needing right now so I crossed my fingers hoping for the best! the packaging is really sleek and definitely feels luxurious and expensive. The smell reminds me of something from my childhood that I cant put my finger on but I definitely don't like it, its quite chemical and I wasn't mad about having to put it on my face. I didnt need to use a huge amount so I think the tube would last quite a while which makes it good value for a masque. I think i paid 35.00 for a 75ml tube. the upside is my skin retained some of the luminosity after I washed the mask off and my skin looked a lot fresher than It had before and so in turn my skin did look less stressed and younger. Its a nice masque to take 20 minutes out for yourself to relax with and in spite of the smell I did use again and will continue to as it really does work. Anatomicals sleep balm cruisin' for a snoozin' comes in a little blue tin a bit like a tin of vaseline, anatomicals packaging in general is quirky and fun , there is a little poem on the tin relating to the product that makes it feel extra special. inside is a hard balm that you rub on your pulse points to help you to sleep. the smell (having a problem with smells) is probably lovely to most people but I hate ....and yes hate is a strong word but exactly the one I want to use, I hate Lavender yuck!!!!! so this product smells of Lavender which turned me off instantly but most normal folk probably would be ok with! I rubbed in on my wrists going to bed and I slept all night although Im not entirely sure that the balm really did help? I was slightly disappointed with it as I love anatomicals headache balm and was so excited to try this. I wont repurchase this but im pretty sure its the lavender that killed this one for me. Finally sanctuary sleep range comforting night butter this claims to reduce tension & stress helping to prepare for a restful nights sleep.The packaging is simple clear pot with a purple lid, its very recognizable as sanctuary brand immediately. This product for the last few months has been my 'I cant live without it, desert island must have' forget about just before bedtime I use this for everything, the smell of this cream is divine, its the smell of pure relaxation! its a really rich cream and it definitely reduces tension & stress. I use this to help relax my muscles if im sore, if im stressed I rub some on the back of my neck and shoulders to soothe me and of course at bedtime, it makes me feel so cosy going to sleep. I highly recommend this product as my top product for relaxing and de-stressing, Im so obsessed with this i now have the mini version which comes with 'sleep in a box' and it lives in my handbag, which you can see in my handbag essentials post. hope you all enjoyed this blog post I went on a little make-up shopping spree recently and am waiting for my goodies to arrive so next post will be all about that haul.